The characteristic traits of giftedness are often misinterpreted by parents and other professionals who have little or no training or information about the nature of giftedness. Incorrect interpretations or a misdiagnosis could potentially harm the developing self-concepts of gifted children. Negative stereotypes are often associated with those raised in generational poverty. Of all these stereotypes, one of the most damaging in education today is that students from low-socioeconomic backgrounds are less likely to be gifted. Low verbal skills often mask true giftedness. It’s time to get past the stereotypes and begin uncovering giftedness in our low-SES students. Intense, loner, wallflower, focused… these are just a few ways introverts are frequently described. Whether its in the classroom, at home, or on the playground, these reserved individuals often get lost in the shuffle. Although we predominantly live in an extrovert world, it is important to remember that introverted gifted students have so much to offer. Gifted students are a lot like snowflakes; no two students are alike. While one student might need very little encouragement to excel, motivating the next might feel like trying to wring sap from a tree with bare hands. There’s no sweeping answer to motivation, but there are prescriptive strategies that can help to encourage the gifted underachiever. This course is intended for parents of gifted children. There is no such thing as healthy perfectionism. The demands of perfectionism can inevitably leave gifted students feeling discouraged and burned out, and that can lead to procrastination. Learn from Ms. Comallie-Caplan’s personal journey as she discusses methodology for helping students move past perfectionism and procrastination. Imagine making a lifelong, unattainable goal. How would you feel day after day, year after year of continually not reaching your goal? Would it lead to frustration...anxiety...depression? That is the experience of a perfectionist as Lisa Van Gemert, M.Ed.T., explains in “Perfectionism in the Gifted Child.” In this 1-hour course, you will learn the different ways perfectionism is expressed and gain practical strategies for helping students overcome failure. Dr. Debbie Troxclair has been following perfectionism research for the past 40 years. Due to her close study of the subject, and her experience as a teacher, Dr. Troxclair presents a course that is rich in insight and resources. Perfection Revisited (for parents), will give your parents a plethora of information, including ALL of her resources, references, and publications referred to in this presentation. This package contains six 1-hour courses by Lori Comallie-Caplan, each addressing a different aspect of the social and emotional needs of gifted and talented students. Technology is everywhere and for many teachers, understanding technology can be like trying to understand a new language. It can be difficult to learn, let alone know which tech tools are worth using in the classroom and how to use them. In “60 Tech Tools in 60 Minutes,” Dr. Housand gives us a crash course on tools that you can use in your classroom. It only takes an hour to figure out which tools you can use for your classroom. Just imagine being able to leverage one of these tech tools and what it can do for your classroom. Your students will get more out of their experience and your teaching career can be even more fulfilling! It is critical that college bound gifted students develop strong writing skills that they can fluidly translate across content areas, apply to critical thinking, and verbal communication skills. In this course, you will learn how to craft an AP language class around a central theme and pull many examples of modern and historical literature. There is a big difference between being argumentative and fine tuning the skills of argumentative writing. In this workshop-style course, you will learn the basics of excellent argumentation and how to teach your students to support their claims in writing using texts, topics, and evidence. 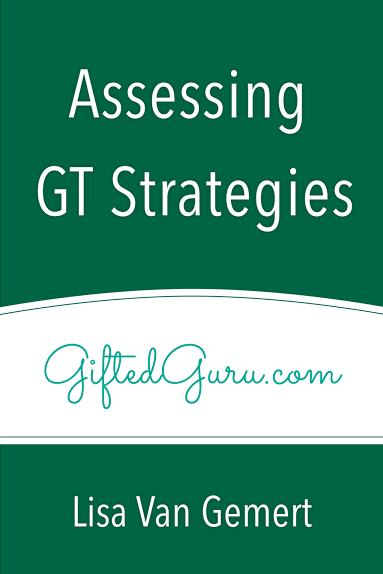 How do you evaluate G/T strategies in the classroom when none of your instruments are designed for them? Discover user-friendly ways to get a clearer picture the next time you assess gifted strategies in the classroom. “I'm bored!! !” This is a dreaded phrase for parents and teachers alike. But there is more to it than you might realize. Boredom itself is an extremely interesting topic to study, and understanding it better will help you engage students in meaningful ways and overcome the mental block that boredom can cause. In this 1-hour course, Lisa Van Gemert, M.Ed.T., explains the research on boredom and how to conquer it in the classroom. Differentiation is a much discussed and extremely important topic in education. However, many teachers may still be struggling to implement it. How do you reach many students at different levels of readiness and knowledge? In this 6-hour course, Lisa Van Gemert, M.Ed.T., will take you through the book “Strategies for Differentiating Instruction: Best Practices for the Classroom,” providing discussion, reflection, and practical tips for implementation in your classroom today! As a teacher and administrator, Mr. Delandtsheer has come to embrace the philosophy “Whoever does the work gets smarter.” He explains, we may need to revisit the type of work that is required of students and how we view them in order for our children to succeed in the 21st century. What good is a tool if we do not teach a child how to use it? If information is a tool, critical thinking skills are the key to making that information useful for our students. In this course, you will learn how technology in the 21st century has changed the way G/T students interact with information and how it helps them build critical thinking skills in the classroom and beyond. Can you imagine driving a race car with only bicycle brakes to stop you? In this digital age, our students' brains have been trained like race cars by the volume and speed of information that they have been processing since a very young age. But what happens when they must slow down and process information in a non-digital setting, like a classroom? In this course you will learn how to identify the effects of digital media on students and how to apply proven methods for adding depth and complexity to your AP and pre-AP classrooms. While we have spent energy on finding and implementing a variety of procedures to ensure that gifted children from poverty are identified for our gifted programs, much less energy has been put into building the skills for success that will enable them to flourish in the gifted program. In this course, Dr. Juntune explores strategies to change the way we work with low-SES students. Children who are raised in poverty or low-income households are much more likely to drop out. Gifted children raised in poverty are particularly at­ risk. But that doesn’t have to be the case. These children can all succeed. They can go to college. They can do wonderful things if someone will take the time to build their complex language skills and verbal memory.